Smoked salmon is one of my favourites for breakfast or brunch...I love it! If it's on the menu, I'm choosing it! This smoked salmon bagel pizza is great if you're after a light brunch dish or perfect for entertaining. You'll be in flavour heaven with the crispy base, cream cheese and capers. So easy to make with only 2 ingredients for the bagel base, bake for 20 min, add the toppings and enjoy! In a medium bowl combine the flour and the yogurt. Mix with a fork or spatula until well combined, it will look like small crumbles. Lightly dust flour on a work surface and remove dough from the bowl, knead the dough a few times until dough is tacky, but not sticky (it should not leave dough on your hand when you pull away). Spray a 20cm x 30cm pan with oil. Place dough in pan and press dough out to the edges. 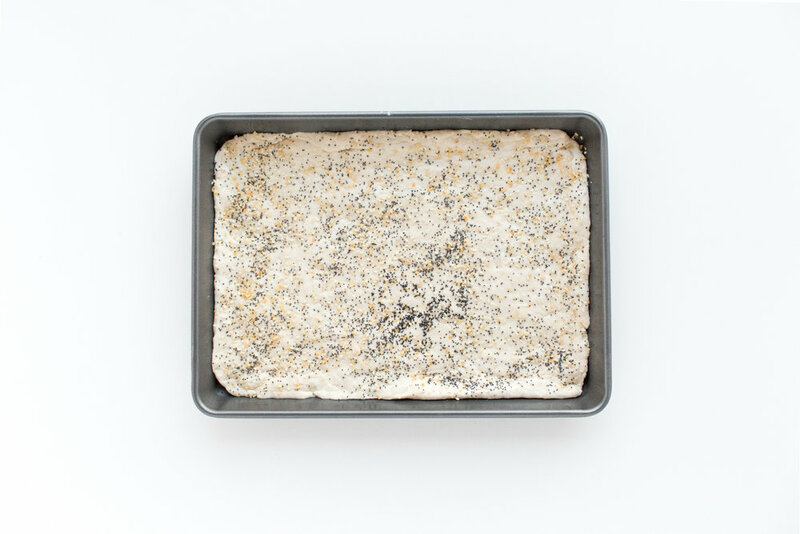 Brush dough with egg white and sprinkle with poppy seeds, sesame seeds and dried garlic. Bake for 18-20 minutes or until golden. Let stand for 5 minutes. Carefully turn, top-side up, onto a board. Add small spoonfuls of cream cheese over pizza base. Top with salmon, onion and capers. Drizzle with olive oil, top with rocket and add dill if you'd like. Serve and enjoy!